The Serco PAL Power-Assisted Leveler™ provides the ultimate reliability and flexibility in today’s fast-moving loading dock environment. The PAL is ideal for customers whose workloads demand more performance than a mechanical leveler can deliver. 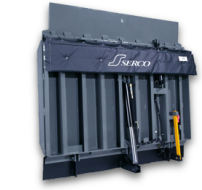 Serco’s power-assisted dock leveler is simple to operate and reduces downtime to provide the perfect balance of power and performance. The PAL is a combination of two proven technologies, the power and durability of a mechanical leveler and Serco’s proven, high-performance, hydraulic operation. Unlike mechanicals with a powerful upward bias, the PAL utilizes a hydraulic power-pack assembly and counterbalance assist to produce a slight downward bias. By eliminating pull-chain hold-down mechanisms, adjustable lip extensions and the necessity to walk down decks, the PAL eliminates the physical demands required to operate mechanical levelers. Maintaining a clean, efficient warehouse environment is critical for a growing number of companies operating climate-controlled facilities. Serco’s WatchDog Vertical Levelers directly contribute to environmental efficiency, security and cleanliness – allowing you to take control of your warehouse. Platform will automatically free float with the trailer when leveler is within 18″ of the truck bed to avoid possible interference with material handling equipment. Maintenance locking bar with lockout pin prevents use while maintenance or cleaning is in process. The dual-acting main cylinder hydraulic system provides the leveler with controlled power-up and power-down performance. The run-off guards on the deck assembly prevent forklifts from driving off for extra safety protection.